The time has come, as it does every two years, for the senior members of Hong Kong’s oldest Triad, the Wo Shing Society, to elect a new chairman. Fierce rivalries emerge between the two eligible candidates. Lok, respected by the Uncles is the favourite to win. But his rival Big D will stop at nothing to change this, including going against hundreds of years of Triad tradition and influencing the vote with money and violence. When Wo Shing’s ancient symbol of leadership, the Dragon’s Heat Baton, goes missing, a ruthless struggle for power erupts and the race to retrieve the Baton threatens to tear Wo Shing in two. Can Wo Shing balance their traditional brotherhood ways with the cut-throat modern world of 21st century business? Nominated for the Best Film, Best Director (Johnnie To), Best Actor (Tony Leung Ka Fai ), Best Supporting Actor (Wang Tian Ling) and winning the Best Sound Effects: May Mok & Charlie Lo and Best Original Screenplay: Yau Nai Hoi & Yip Tin Shing at the recent Golden Horse Awards in Taiwan. With so many nominations and two wins, it’s worth checking out this Hong Kong triad movie to see why is it so acclaimed, and if you had missed it in the cinema, it’s out on Dvd now. As the synopsis spells out above, this dwells on another chapter of Hong Kong’s ever-popular triad-and-gangster fable that has entranced audiences all over the world. 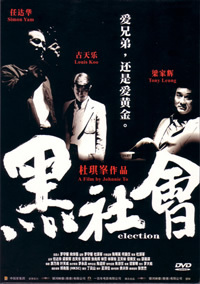 This tale recounts the power struggle between the two eligible candidates to be the new Chairman of Hong Kong’s oldest Triad. In the midst of struggle, the Baton symbolizing the leadership of the Triad went missing and it is all up to the followers of both candidates to get hold of it before it falls into the other party’s hands. One of the interesting elements in this movie was how it showcased the workings of triads, maintaining 100-year-old traditions and their unbridled loyalty to the code of brotherhood. Like the tagline, if it were three hundred years ago, they would be considered as martyrs. Another reason to watch this movie would be for the performance of the two rival candidates. In one corner, there stands Tony Leung as the wild and crazy Big D who had been bribing allegiance on his way to becoming the new triad leader. In the other corner stands Simon Yam’s Lok, calm and collected. As usual, it is always entertaining to see both veterans perform in their respective roles. This movie also features many well-known Hong Kong TV series stars such as Louis Koo but their characters had limited screen time and don’t really make an impact in this movie as much as the two leads. Before the movie truly ends with the credits rolling, there will be plenty of twists and turns to surprise the audiences. Although I have never seen both the Hong Kong version and Chinese version to do an accurate comparison on the ending, the finale was similar to the Chinese version of the Infernal Affairs where there was an unexpected delivery of the morale that Good always trumps over Evil. So this is an ideal version for the audience who does not want to risk influencing their kids and youth with the “glamour and glitz” of triads. This Dvd only contains a trailer for Andy Lau’s recent movie, “Wait till you are older” in a mixture of Cantonese and Mandarin soundtrack. In Mandarin Dolby Digital 2.0 that will perform well for this dialogue laden movie and most normal viewers who view this Dvd on a normal Television. This film uses plenty of shadows and semi-darkness scenes and Dvd’s picture quality was able to differentiate the actors from the shadows decently.